It’s no secret that I’m a fan of lemonade and vodka cocktails, this Framboise-boosted refresher is my latest addition to the repertoire. Using just three main ingredients — a high quality store-bought lemonade (I’m rather taken with the classic lemonade from Evolution Fresh), vodka and raspberry dessert wine — plus a splash of seltzer to add a touch of effervescence and cut the sweetness, you’ll quickly have a cooling libation in hand. The amounts listed below are a good launching point for this cocktail, basically there’s no need to be super precise. Depending on the brand of lemonade used, and personal preference, you may need to adjust the amounts. 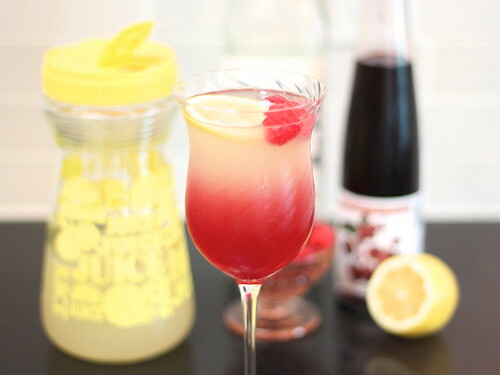 I really liked the full, natural flavor of Evolution Fresh’s lemonade — it didn’t skimp on the lemons and was certainly sweetened enough — but it definitely required a hefty splash (2 ounces) of seltzer when used in this drink, in particular because the Framboise is so sweet!! In a cocktail shaker or Mason jar with lid, combine lemonade and vodka with a couple cubes of ice; cover and shake until chilled. Strain into glass, add a splash of seltzer to taste and gently pour in raspberry wine for a layered effect. Top with a few cubes of ice, and garnish with a lemon slice and a few raspberries (if desired). Enjoy! Dill and Onion Rice Avocado Toast Goes Gluten-free, Naturally!